Research Site Simulates Extreme Weather To Test Building Materials After back-to-back hurricanes and wildfires, insurers are looking for more-resilient construction materials. That means building model homes and then blowing off their roofs or setting them on fire. 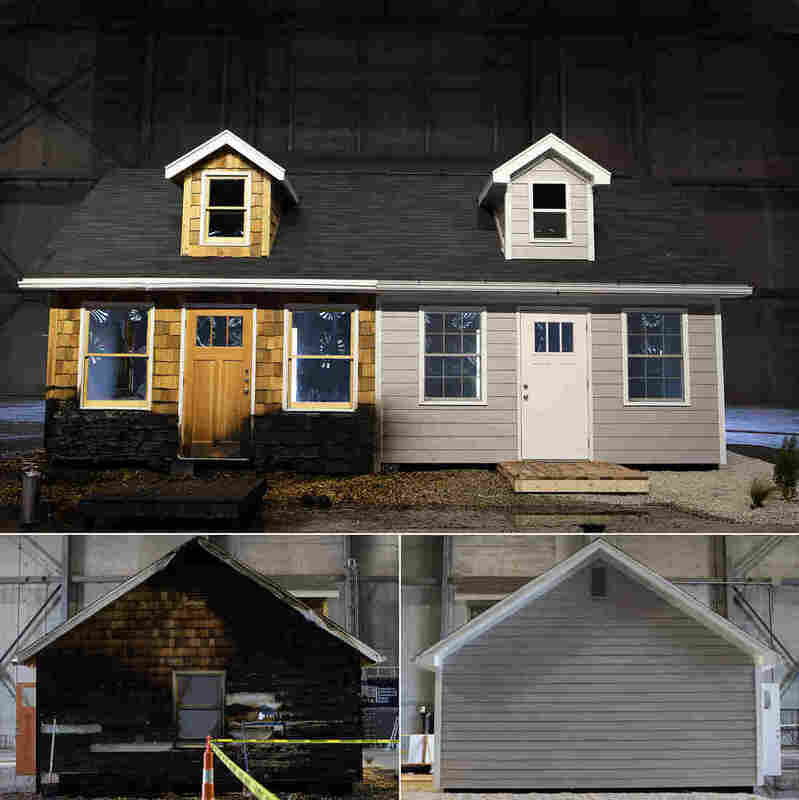 Flames creep along the cedar siding on a test house hit by blown embers at a research facility run by the Insurance Institute for Business & Home Safety. 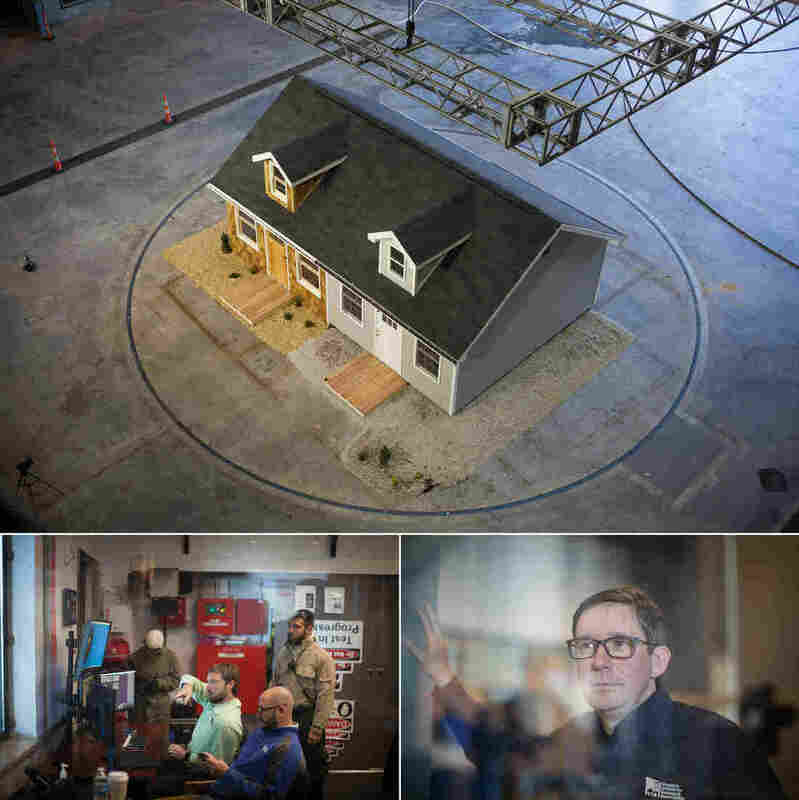 An hour south of Charlotte, N.C., two forks in the road beyond suburbia, a freshly constructed house sits in a wind tunnel waiting to be set on fire. To the left of the house is a brick wall with a hole in the middle, made by a 2-by-4 propelled at 70 miles per hour. In front of the house is a metal staircase five stories tall. At the top are the hail guns. More than 100 fans begin to turn, slowly at first and then faster. The ember generators flicker on. The fire is about to begin. The past two years have been particularly costly for insurance companies that are on the hook for billions of dollars in damage done by hurricanes, wildfires, floods and other disasters. As these disasters become more frequent and expensive, in part because of climate change, insurers are investing more in this research facility that studies how to protect homes and businesses from destructive wind, water and embers. The research site in South Carolina has a wall of 105 fans that can generate wind gusts to blow embers. Fire engineers say most homes that burn during wildfires are ignited by embers, rather than a wall of flames. The facility in rural South Carolina is run by the Insurance Institute for Business & Home Safety, a nonprofit research organization funded by U.S. insurance companies. 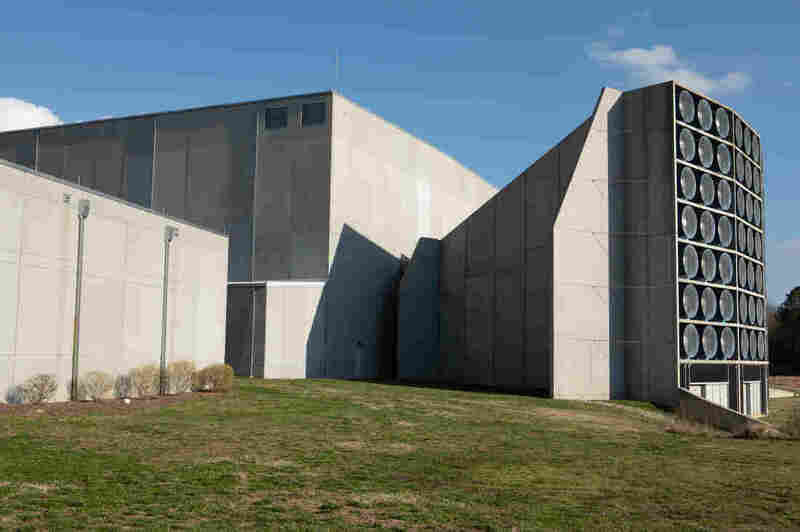 The concrete building the size of an airplane hangar can generate hurricane-force winds, realistic hail and wind-driven rain and embers. "This is the only full-scale lab of its kind in the United States," explains Roy Wright, the organization's president and CEO. The facility was built in 2008, in the wake of Hurricanes Katrina, Rita and Wilma, with millions of dollars from the insurance industry. Since then, and especially in recent years, industry support for the facility has only grown. "We've hit an inflection point where we're seeing more events impact more Americans," Wright says. "Our members have increased their investment and said, 'We want more researchers here. We want to see more activity playing out here.' We are collectively responding to this changing world that we're in." Today, the annual budget is just shy of $15 million, and the facility regularly tests, among other things, the resilience of commonly used types of roofing, siding, garage doors, porches and even landscaping during disasters. 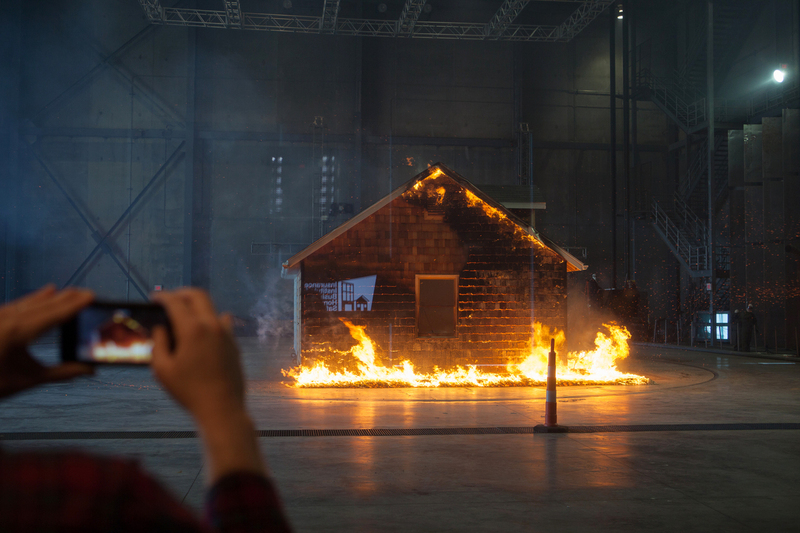 The most recent full-scale test was a wildfire simulation. Engineers designed and built a full-size duplex home. On one side, the house has cedar siding, vinyl gutters, single-pane windows and bark mulch around the foundation. On the other side, the house is designed to be fire-resistant, with cement siding, metal gutters, double-pane windows and gravel around the foundation. 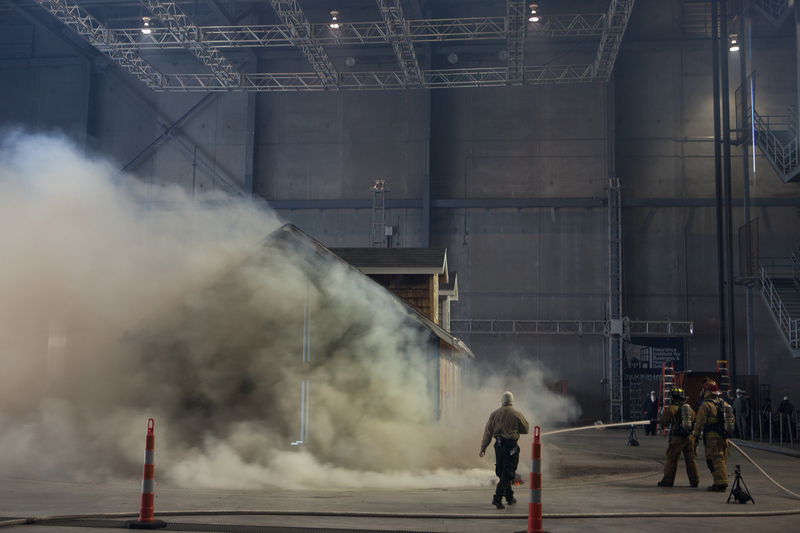 "We've used construction materials and building practices that we have found through our research, and others' research, makes a building resistant to wildfire exposure," explains fire engineer Daniel Gorham, who helped design and carry out the fire test. For example, a 5-foot zone around the fire-resistant side of the house is devoid of combustible material, including plants. That's important, Gorham says, because the majority of homes that burn during wildfires aren't ignited by a wall of flame. Instead, embers can blow hundreds of yards or even miles, starting blazes far from the main wildfire. When embers land on gravel, they eventually burn out. But when embers land on mulch, dry leaves, plants, deck furniture or other combustible materials, they can start new fire. And if the house has a wood deck or siding, it's especially likely that the house itself will eventually burn. The full-scale test was designed to study both scenarios side by side by directing ember-laden wind at the duplex and seeing what happened. The difference was starkly clear: After a few minutes, one side of the house was engulfed in flame, while the other side was entirely unaffected. Local firefighters stepped in to put out the fire before the house burned to the ground. "The side-by-side couldn't be more surreal," Wright says. "One side fully engulfed, and the other side's getting just as many embers, just as much pummeling it, and it's just going, 'I can take it.' "
A 2018 report by Headwaters Economics, a Montana-based group that studies land management, found it costs about the same amount to build a new fire-resistant house as it does to build a typical house with cedar siding. The test results on how different parts of the house performed will be incorporated into public reports meant to help homeowners, business owners and local officials who set building codes and plan for disasters. There are similar reports about protecting homes against the hail, wind and wind-driven rain that accompany hurricanes and tornadoes. More granular versions of the research findings are shared with the companies that fund the research. Wright says companies can use that information to help set insurance rates or to educate local insurance agents who field questions directly from policyholders. Members of a local fire department work with research facility staff to extinguish the burning test home. Of course, the real test of a building's resilience is during a real storm or fire, and in many parts of the country, the majority of homes and businesses are not built to withstand severe weather. Building codes are established and enforced locally and vary widely, even across single states. "That's where sometimes the wheels fall off," explains Thomas Welle, head of the Denver field office for the National Fire Protection Association, which develops building standards for new homes and businesses. Sometimes, Welle says, "standards are adopted piecemeal instead of whole. And sometimes they're not enforced." For example, some counties require that builders create a perimeter without combustible materials around a newly built home, but then there are no follow-up inspections to enforce that rule. And Welle says those in the private sector, including realtors and the insurance industry, have a role to play, especially when it comes to incentivizing upgrades to existing buildings to make them more resilient. Although insurance companies are barred from working together to set prices, for example, Welle explains "they can agree on some kind of best practices to at least promote that kind of thing." Roof resilience is an area of particular interest to insurance companies and to homeowners who live in hurricane-prone parts of the U.S.
After Hurricane Michael came ashore in Florida last year, the Insurance Institute for Business & Home Safety studied which buildings were damaged and what the buildings that survived had in common. They found the storm's intense wind and rain mirrored lab results that suggested unfortified garage doors and unsealed plywood on the roof could fail catastrophically during storms, leading the roof to rip off the house or water to flood in as shingles flew away. Similarly, wildfires in California last year offered insight about how to reduce risk in fire-prone areas. Many of the homes that burned in Southern California's Woolsey Fire appear to have been ignited by embers landing on combustible material on or near the house. Simply changing the landscaping or porch setup could help such homes survive. In Northern California, the deadly Camp Fire came with a different lesson: no one is invincible. Wright's parents lost their home in the fire. "There are ways to prepare for disasters," Wright says. "But there's always this sense of hopefulness or invincibility that it's not going to affect you." 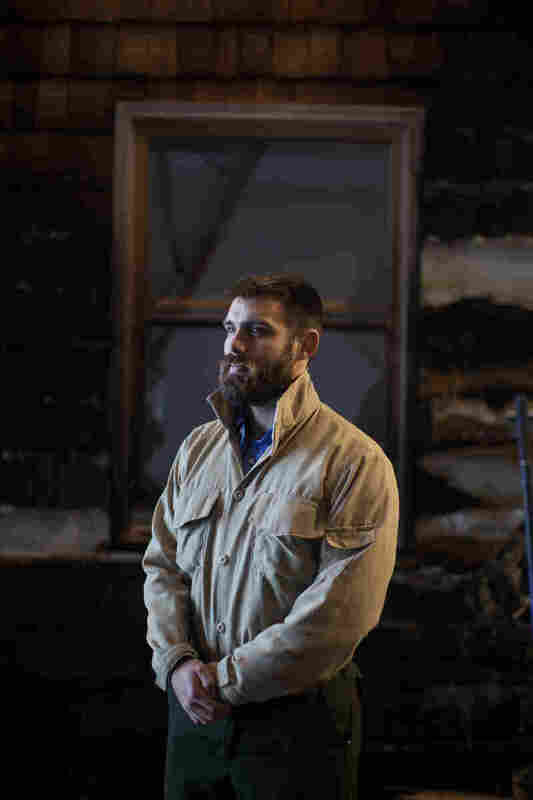 He says helping his parents file insurance claims and figure out how to piece their day-to-day lives back together has underscored the importance of presenting actionable research that can help people become more resilient to severe weather. "Our work here is not just about 'What does the science look like to build the best way?' " he explains. "The question is, 'Is there a better way that is affordable?' Because if it's not accessible to a homeowner or a business owner, it just becomes more noise in the system."